CCG PENSIONS is a leading and trusted consulting firm focused primarily on employee benefits plan design, plan administration and actuarial services. When it comes to plan design, CCG Pensions adheres to the CCG group core value of Fiduciary [Not Broker] Standards. This means we see it as our duty to put your interests ahead of our own—always. This is of critical importance to plan sponsors. Why? Because so many qualified plans are being designed by brokers as vehicles to sell their investment products, irrespective of whether their investment products have the characteristics necessary to justify them being recommended as plan investment options. This has serious implications for both the plan sponsor and the plan participants. As a broker cannot become the plan Investment Manager as defined by ERISA (and thus take on the role of fiduciary), the pension plan sponsor remains the fiduciary, creating substantial personal liability for the plan sponsor. Unless the pension plan participants have access to investment options that have been selected only after passing through a rigorous initial and ongoing screening process, the investment returns may well be impaired and potential liability is thus increased. CCG Pensions will never design a plan based on the compensation received from the sale of investment products. To ensure its complete independence, to eliminate bias and conflicts of interest, CCG Pensions operates on a flat fee only basis. We are compensated directly by our clients for services rendered. Further, if there is ever any other form of compensation paid to CCG Pensions by a vendor for a product or service we recommend to you, we guarantee, by contract, to disclose such compensation and to apply it against our consulting fee. CCG PENSIONS is unique in that we provide a Fee Guarantee. You’ll never have to wonder if a recommendation is being made because CCG Pensions is being paid by someone else to make it. When the plan is designed and delivered, someone has to be responsible for the implementation and ongoing administration of the plan. CCG Pensions has proven that unless plan implementation and administrative services are provided by the pension consulting firm, the client is left with split accountabilities. The CCG Pensions two component structure ensures that we are always fully accountable for the successful operation of our recommended plan. For 38 years, CCG Pensions has been providing clients with our unrivalled two component service structure—Plan Consulting and Design to Fiduciary [Not Broker] Standards and Full Plan Implementation and Administrative Services. It is for this reason that CCG Pensions has become the trusted name in pension plan consulting and why so many of our clients have remained with us for decades. As CCG Pensions is structured to ensure its complete independence as regards your qualified pension plan, we intentionally limit our role to that of your plan consultant (and, if engaged to provide such services—plan record keeper). 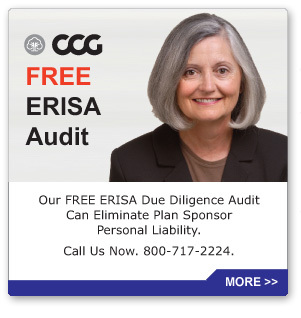 As such, CCG Pensions will never become the Investment Manager as defined by ERISA. Accordingly, CCG PENSIONS does not at any stage become a fiduciary in the plan. If however, the plan sponsor should elect to engage CCG Investments as the plan’s Investment Manager, CCG Investments will acknowledge by contract that it is the fiduciary for the plan investments, thus shielding plan sponsors from their personal liability.